Among 46 African countries studied, South Africa ranks poorly for prepaid mobile telephony affordability. 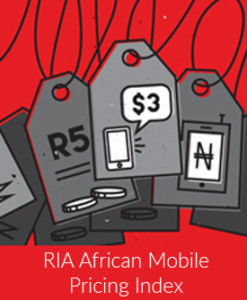 Ranked 30th out of 46 African states, South Africa is now far behind countries where the regulator, unlike in South Africa, has enabled competition by enforcing cost-based mobile termination rates. The resulting competition has in many cases driven down prices for consumers. Not long ago, South Africa and Namibia shared the same mobile termination rates and had similar end-user prices. Today, Namibia enjoys amongst the cheapest mobile prepaid prices in Africa, as a result of the slashing of its termination rates close to cost, which pressured the incumbents towards cost-based pricing, thereby increasing demand and remaining highly profitable. 1. Why did you focus only on prepaid? 2. Do you expect prices to decline further next year when MTRs drop to 40c? 3. Could you send through the January 2012 OECD Lower User Baske costs in USD table that includes PPP factor?